When I’m asked to bring an hors d’oeuvre to a gathering, I always have a momentary feeling of panic. When I entertain I usually don’t spend much time thinking about appetizers because I’m always focused on the main course or dessert, so I strive to keep my appetizers very easy and light. 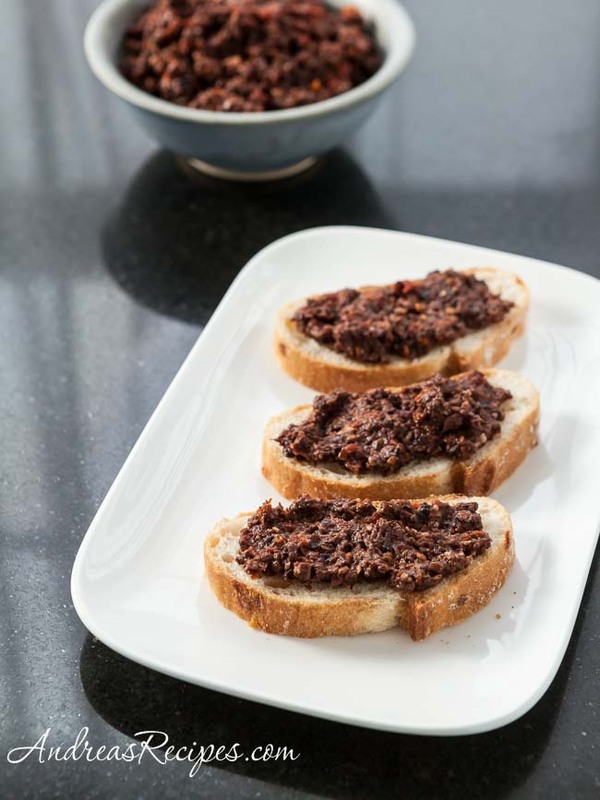 Tapenade definitely falls into the easy appetizer category because you just toss everything into the food processor and pulse it a few times. It really is that simple. Traditional French tapenade is a puree made from black olives, capers, anchovies, and olive oil. Since I’m not a fan of capers or anchovies, you won’t find either of those in my version, but you still need only three or four ingredients to make a fantastic appetizer. You can make this up to two days in advance and keep it in the refrigerator. To serve, bring it back to room temperature and stir well. Sounds delicious … I’m just about to make slow-roasted tomatoes using Kalyn’s recipe as a guide … so then I’ll carry on and make this. I’m just the same, panic at the thought of nibbles! This looks awesome! I’m not a big fan of capers either but I love sun-dried tomatoes! Hi Amy and Joanna, and thanks for stopping by! I took the tapenade to a Bunco night last weekend and the ladies really enjoyed it. I got several requests for the recipe. I also tried it over cooked pasta sprinkled with a bit of Parmesan cheese, and that made a nice light lunch. Andrea, what a delicious idea! Mmmm…I love the sound of this tapenade and agree that it would be terrific with that potato foccacia. Delish! Hi Sue. I don’t know where you live, but here in Virginia we can often find it in the store aisles with condiments or specialty foods. If you want to make it, this recipe makes about 15 ounces of tapenade.